The search for an 11-year-old murder suspect ended here today in a dank, graffiti-scarred pedestrian underpass, where the boy was found dead in a pool of blood and mud. He had been shot at least once in the back of the head, apparently, the police said, by the same street gang that put a gun in his small hands and shoved him into the grown-up world of violence and death. 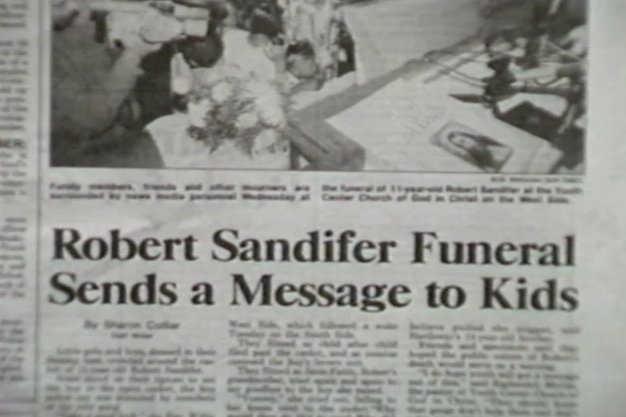 For three days the boy, Robert Sandifer, had eluded the police and saddened the city because he was so young and troubled and because there are so many other lost children like him in big cities and small towns across the country. On Sunday night, the police say, on behest of his gang, Robert fired a semiautomatic pistol into a group of teen-agers playing football on the Far South Side. A boy was hit in the hand and 14-year-old Shavon Dean was struck in the head and killed, a few yards from the steps of her home. Robert lived around the corner from Shavon, and today the neighborhood seemed stunned by the loss of two of its children, one an innocent bystander, the other a child robbed of his innocence a long time ago. "The boy's death just makes the whole situation sadder," Tawana Thomas, a friend and neighbor of Shavon's, said today. "Him being dead doesn't prove nothing. Shavon's not back. It's just more grief and sorrow for our neighborhood. "Shavon's aunt, Ida Falls, standing on a wooden porch two houses away from her niece's home, hugged a friend and told her not to cry, that God was looking out for Shavon and Robert, too. But after the friend left, Mrs. Falls said, "I don't think I can take no more of this." At 10:30 in the morning on Sunday, August 28, 1994, eleven year old Robert Sandifer, nicknamed “Yummy” for his love of cookies, left his house at 219 West 107th Place in the Roseland neighborhood in the South Side of Chicago. He said he was off to a gas station at 111th & State Street, more than a half mile away, where local children pumped self-serve gas for customers to earn tips before station workers would chase them away. At first glance, Yummy’s bedroom resembled most other Chicago children of his age. Posters of Michael Jordan and Disney characters were tacked to the walls and ceiling. However, a closer look revealed a boy whose childhood innocence had long since vanished; gang insignia was scrawled above the door, gang logos were scribbled on the woodwork. Away from his house “playing all day,” according to his grandmother, Yummy, standing 4 feet 6 inches tall and weighing 86 pounds, approached a group of boys standing at 10758 South Perry Avenue near the corner of West 108th Street around 6:30pm. Yummy, a tattooed member of the Black Disciples gang, approached 16 year old Kianta Britten, asking him what gang he was affiliated with; the Black Disciples were warring with the Gangster Disciples, another powerful Chicago street gang. When Britten said he wasn’t in a gang, Yummy, a member of the Black Disciples set called the “8 balls,” pulled out a 9 millimeter semiautomatic pistol at nearly point-blank range. Britten ran. Yummy opened fire, striking Britten in the stomach with one bullet and striking his spinal cord with another. Britten would spend the next several months in hospitals and rehabilitation clinics, unable to walk for eight months. Yummy was pronounced dead at 2:20am, on Thursday, September 1, 1994. Cook County Medical Examiner Edmund Donoghue, performing an autopsy on Yummy, discovered the physical evidence of his hardened and abusive life. Yummy, with one copper-jacketed .25 caliber slug embedded in his not yet fully formed brain, had a tattoo on his right forearm, “BDN III,” which represented the Black Disciples Nation. Earlier in the week his grandmother had told reporters he had a tattoo that read “I love mommy.”“There were 49 scars,” said Donoghue at the trial of Derrick Hardaway. “I had to use two diagrams.” There were so many scars on Yummy’s body he could not use the one chart typically used by medical examiners. “I WANNA DEDICATE THIS ONE TO ROBERT “YUMMY” SANDIFER AND ALL THE OTHER LIL’ YOUNG NIGGAS THAT’S IN A RUSH TO BE GANGSTAS,” THE NOW DECEASED TUPAC SHAKUR INTONES AS AN INTRODUCTORY OVERTURE TO, “YOUNG NIGGAZ” ON ME AGAINST THE WORLD WHICH DEBUTED AS THE NUMBER 1 ALBUM ON THE BILLBOARD 200 IN MARCH 1995. Yummy averaged a felony a month for the last year and a half of his life; 23 felonies and five misdemeanors in all. Maybe Yummy figured out that the gang's protection was not worth much. Janie Fields last spoke to Yummy Wednesday afternoon before he died. "He said, 'What is the police looking for me for?' I said, 'I'm coming to get you.' I had clothes with me 'cause I knew he was probably filthy and dirty. My heart was racing. I said, 'You ain't done nothing wrong, just let me come and get you.' " The phone went dead. She went to 95th Street, where he said he would be. "He wasn't there." But he appeared that night on a neighbor's porch, visibly frightened, asking that she call his grandmother so he could turn himself in. He asked if they could say a prayer together. The neighbor went to make the call, and when she came back, he was gone. The police can only guess what happened next. Derrick Hardaway, 14, and his brother Cragg, 16, both honor students and fellow gang members, found Yummy and promised that they could help him get out of town. They drove him to a railroad underpass, a dark tunnel marbled with gang graffiti. Yummy's body was found lying in the mud, with two bullet wounds in the back of his head. Now it's the Hardaway brothers' turn. Authorities say gang leaders, who can easily order hits in any prison in the state, may have the Hardaways targeted next. Both boys were arrested and are being held in protective custody. As for the other children in Yummy's neighborhood, when they are asked what would make them feel safer, most give the same answer: getting a gun. Among other things, it would protect them from the children who already have them. There were those who were missing Yummy last week, those who had seen the child and not the killer. "Everyone thinks he was a bad person, but he respected my mom, who's got cancer," says Kenyata Jones, 12. Yummy used to come over to Jones' house several times a month for sleep-overs. "We'd bake cookies and brownies and rent movies like the old Little Rascals in black and white," says Jones. "He was my friend, you know? I just cried and cried at school when I heard about what happened," he says, plowing both hands into his pants pockets for comfort before returning to his house to take care of his mother. "And I'm gonna cry some more today, and I'm gonna cry some more tomorrow too." Completing the portrait of youth snuffed out were Cragg and Derrick Hardaway, the boys convicted of Yummy's murder. The crime cost them the balance of their youth and then some. Cragg, the triggerman, is 34, and he's expected to be paroled when he's 46. Parole for his brother, now 32, is expected in 2016. If they return to the crime scene, they'll find it isn't there. Concrete caps the tunnel's entrance on one end, grass on the other, creating a tomb of sorts around the place Yummy died. Half a block from there one recent afternoon, Jerry Stokes sat on his front steps. He and Yummy were the same age, and they knew each other. Stokes said little has changed on his strip of Cottage Grove Avenue since Yummy died. "That shocked the world," Stokes said. "Then it faded away."